Mobile network service provider revenue streams continue to be disrupted by alternative providers. As an example, the messaging market is forecast to decline from $113.5 billion in 2014 to $112.9 billion in 2019 – that's a reduction of $600 million, according to the latest market study by Juniper Research. Ironically, messaging traffic is forecast to double by 2019. This is driven by over-the-top (OTT) messaging software applications -- such as WhatsApp and LINE -- seeing a threefold increase in message traffic from almost 31 trillion in 2014, to 100 trillion by 2019 globally. Importantly, the revenue generated from each OTT message is forecast be less than 1 percent of that from mobile service provider SMS and MMS in 2019. 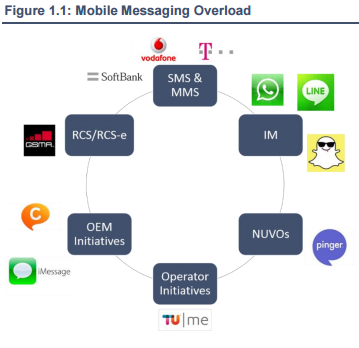 Juniper's latest study found that OTT messaging services are facing a struggle to monetize their freemium services. Combined with users switching from SMS and MMS services, this will contribute to a contraction in the overall revenue pot. OTTs have not yet succeeded in using advertising at scale to monetize their services, due to a limited acceptance by consumers, particularly in Asian markets. In these markets, messaging services have relied upon in-app purchases such as sticker sets to generate income. According to the Juniper assessment, OTT players are now seeing further diversification with a foray by several big players into the payments market -- for example, LINE Pay, the Facebook use of Messenger to send payments, and Snapcash from Snapchat. Traditional messaging services from mobile network operators have been under threat from OTT offerings for some time. So far, they have been unable to compete with free messaging apps. However, in terms of revenues, SMS still continues to dominate the market, with mobile network operators benefiting from growth in the A2P (application to person) sector. That said, new alternative messaging services could easily launch and innovate at a faster rate and further disrupt the legacy providers. Network operators have already lost too much ground to recover from this established trend. A2P SMS will generate significant growth over the next five years, as enterprise messaging sees considerable uptake in the form of two-step verification, and notification services. User concerns regarding privacy will aid A2P SMS growth - with secure message delivery and reliability being key.